Bring a large pot of water to a boil. Add pasta and cook until al dente. Drain and rinse with cold water. 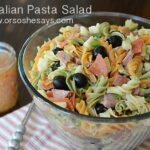 In a large bowl, combine the pasta with all other ingredients, except salad dressing. Add salad dressing right before serving.